DeWitt County (910 sq miles) sits atop what is known as the Edwards Reef Trend in South Texas. Natural gas has been targeted for several years in the county. Development has now shifted to the Eagle Ford Shale, where companies are targeting both oil and gas. DeWitt County forms part of the most prolific area of the Eagle Ford where wells produce greater amounts of condensate and wet gas. Generally, activity in the county is focused on the condensate window and wet gas windows of the Eagle Ford. The dry gas window of the Eagle Ford also passes through the county along the Southeastern border and into Victoria and Goliad counties. Drilling in DeWitt County to date is focused in portions of the county that are prospective for wet gas and condensate. County services of interest to oil and gas lease owners include the Dewitt County Appraisal District (tax collector) and the Dewitt County Clerk (property records) office. The county seat is Cuero, approximately 80 miles southeast of San Antonio, TX. The town of Cuero bills itself as the "Turkey Capital of the World". Other communities in DeWitt include Hochheim, Meyersville, Nordheim, Pearl City, Westhoff, Yoakum, and Yorktown. Join the DeWitt County Discussion Group today - your voice counts! MineralRightsForum.com is a discussion networkfor mineral owners, royalty owners, and industry professionals to discuss oil & gas related topics. Petrohawk and Pioneer were two of the earliest entrants into the play and the two are the most active operators in the county. 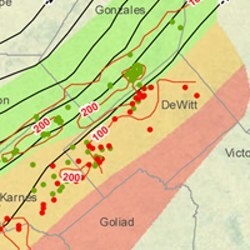 Petrohawk's core and most active area in the Eagle Ford Shale includes the Black Hawk field that spans along the northwest border of DeWitt County. Wells provide some of the best economics in the play and Petrohawk expects its typical well will produce a type curve that yields 1.8 Bcf of gas, 220 Mbbl of NGLs, and 550 Mbbls of condensate. Pioneer has traditionally targeted the Edwards Limestone in DeWitt, but the Eagle Ford is now the formation of choice. The company is targeting liquids-rich zones of the Eagle Ford where wells can produce as much as 200 bbs/mmcf. Pioneer has completed wells that produce more than 10 mmcfd and up to as much 1,000 bbls of condensate per day. DeWitt County officials are championing the effort to improve the county roads. Increased traffic from the Eagle Ford Shale boom has decreased the life of the roads. A year-ago, Naismith Engineering estimated over $400 million is needed to maintain these roads for the next 20 years. While this is likely a high estimate, the State of Texas recently set aside money for improvements to county roads.